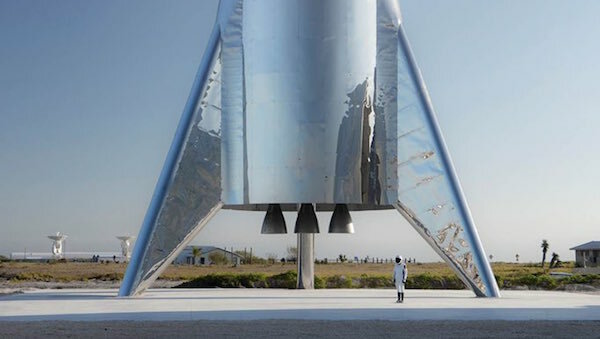 Several days after releasing a rendering of SpaceX’s ‘Starship’ test vehicle, formerly known as the ‘BFR’ or ‘Big F*cking Rocket’, CEO Elon Musk followed up with an actual photo of the spacecraft that has left fans feeling very excited. The approximately 120-feet-tall spacecraft comprises three sections assembled at SpaceX’s Boca Chica facility. ‘Starship’ will pair with the massive rocket booster ‘Super Heavy’ to transport passengers from Earth to other destinations such as the Moon, Mars, the Jupiter moon Europa, the Saturn satellite Enceladus, and more. According to a December tweet by Musk, “‘Starship’ will look like liquid silver” due to its novel stainless steel alloy, which will help the vessel shed heat while traveling through the atmosphere. Though the test craft might look about done externally, more work remains to get the vehicle fully ready for its first flight, slated to occur sometime mid 2019. SpaceX aims to use ‘Starship’ to eventually send Japanese billionaire Yusaku Maezawa and eight artists to the moon for free.